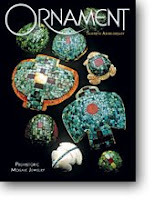 I'm always on the look out for jewelry designers who are doing unusual work, so when I asked my Los Angeles friend, bead/jewelry expert, Ken Rogers, who he would recommend, he pointed me to Eni Oken's Jewelry website. Wowee! Such intricate wire work combined with bold colors for pieces that practically smile! I find inspiration everywhere, as many artists do. I could be talking to someone, suddenly something catches my eye and I have an idea for a design. I also like to look at historic references and to keep a close watch on fashion trends. When I do find inspiration, I draw or write it down in a “creative journal”. Those are invaluable when running out of ideas -- we all go through phases when the ideas seem to go dry. You mention "fantasy" often as you describe your work. How does that factor in to what you do? 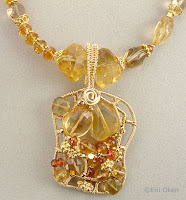 Eni's work is sold only by special order through her website and she also offers online jewelry making tutorials. It was great fun to "meet" someone who so clearly radiates joy and happiness in each piece she designs! You mention on your website that you love the evolutionary transformation of metal...can you talk about this? I love the way that metal can seem so hard, and yet it can be moved and formed as if it were clay. In fact, when I teach forging and forming metal, I help students understand how to move the metal with a hammer by having them think about how a rolling pin can move clay or dough. I love the paradox that “soft”, fluid-looking metal has evolved from flat, stiff rectangles of metal----it’s fascinating that a piece can look soft and squishy, but feel hard and unmovable. Some of my friends like to create in metal by putting forms together. They solve a design problem by adding another element. In contrast, I tend to resolve a design problem by unifying the design, taking away anything extraneous, making it more fluid. I love being able to manipulate metal----making a single complex form out of one piece of metal without adding any other parts. The folded rings are part of this body of work. I like to use gold/silver bi-metal for these rings. The gold on the inside emphasizes the inside vs. the outside. The gold preciousness enhances the intrigue of the inside. The textured edges catch the lit in a way that is more interesting to me than smooth polished metal. I like to make forms that look like something nature could have made----yet are not a copy of something in nature. I prefer inventing new forms, rather than faithfully duplicating one of nature’s designs. 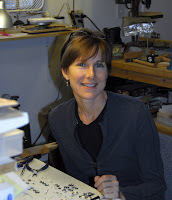 Cynthia creates jewelry and holloware in her studio in Lexington, MA and teaches Advanced Silversmithing and Jewelry at DeCordova Museum School in Lincoln, MA. 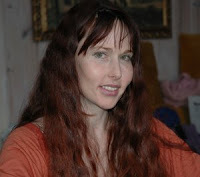 She has worked as a designer and maker of custom jewelry in goldsmith galleries, and as designer/modelmaker and production supervisor at a gold jewelry factory. Cynthia began making jewelry in high school. 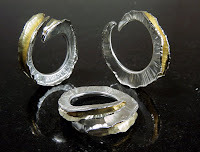 She earned her Master of Fine Arts in Metalsmithing and Jewelry Design from Indiana University in 1980 and a B.S. in Art Education from the University of Wisconsin in 1977. It seems that many of today's jewelry designers were first introduced to the metalsmithing in high school. Tell us about those early experiences and what you got out of it that caused you to pursue it as a career. As a child, my family used to regularly visit my mother’s best friend from college. 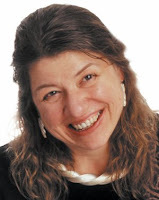 She was married to a man who was a jeweler/silversmith---Ed Niemi was the head of the jewelry and metals department at the University of Illinois in Normal, IL. I always enjoyed seeing his studio and what he made. I think that knowing him helped make this seem more possible as a career. When I was in junior high, my oldest brother came home with a ring he had made in high school. I remember thinking to myself that if HE could make jewelry, then so could I. I talked my art teacher into getting me some carving wax, and I made two rings that he had cast for me. I spent all my free time hanging out and working in the jewelry studio. The teacher had been there for 40 years or so, and I adored her. I remember the hurt of being hidden behind a partition in the jewelry supply room, and overhearing my jewelry teacher say, "Cindy is a terrific craftsman, but so-and -so is really creative." Because I loved and respected her so much, I feared that she might be right. For years those words rang in my head, and I strove to prove them wrong. When I teach, I try to remember how intensely my words can either hurt or encourage. I did not really picture or plan a life as a jeweler or artist. But, I have always made decisions that allowed possibilities, rather than dead ends. For instance, I got a bachelor degree in Art Education, so that I had the possibilities of being a teacher, an artist, or anything that a college degree might be helpful for. At the same time, I always tried to pursue my dreams----I’d rather try and fail than wonder what would have happened if I had only just tried. You are also involved in creating Judaica. How does this work differ for you from designing jewelry? It is intriguing to design works that are aesthetically exciting, are something that I want to make, that fit within my body of work, and yet, the object fulfills a Judaic function. I like to stretch the limits of convention while still making sure that the object will function--- for Judaica, and hollowware, as well. I find it particularly satisfying to make ritual objects that will be used by a family in their home or a congregation in their synagogue. It is wonderful to make a piece that will be publicly enjoyed by generations of people. Your work is part of the permanent exhibit at the Jewish Institute of Religion Museum. You must be proud! I am, indeed, pleased and proud. I am fortunate that my work resonates for the curator. Watch for opportunities. Learn to meet people----it can be scary, but most people are happy to meet others, especially if you say something nice. Follow up on opportunities. If someone asks you to send them photos, or a resume, do so right away---don’t delay, and don’t forget. Try not to be discouraged by rejections. If you try 5 times, and get rejected 4 times, you have one success. If you try 15 times, and get rejected 12 times, you have 3 successes! Each success tends to lead to another. Opportunities multiply. Make sure that your photos of your work are terrific. More people see the photos than the actual work. Mobilia Gallery in Cambridge, MA has a lot of my work, and they are the only place that ALWAYS has my work. Libby and Joanne Cooper have supported me in my work for over 20 years. The Cooper family is wonderful----their grandma used to come in every week to help them. Their sister and mom help out, too. When I brought my parents in to visit, they were treated as esteemed guests. Check my website for other exhibitions and galleries. It was a great pleasure "meeting" Cynthia through cyberspace. It sounds as though she has found true happiness, spirituality and life balance through her beautiful work. My mother grew up on a farm deep in the Appalachian Mountains of Kentucky on the outskirts of a town called Hindman. She was influenced by the arts and crafts of the Mountain folk. She went on to Rice University and studied English and History. After meeting my father who was in the Air Force, after WWII they were stationed in Japan for three years. My mother was fascinated by the history of the Japanese Pearl. Being from a small farm in Kentucky, Japan was a new world that made her realize her passion for jewelry design using the pearl as her main focus. My mother passed away at the age of 80 I spent the last years of her life taking care of her. I felt it to be my passion to carry on the love my mother had of jewelry design. How would you describe your personal creative style and where do you find inspiration for your designs? My personal style is based on aesthetics and elegance. I am not an abstract person; therefore, abstract is not a style that I pursue. I enjoy classic, beautiful lines. When I create a wrap for a stone or a cabochon. I am simply creating an elegant frame to a piece of nature's art. 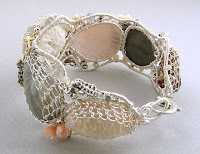 I draw inspiration from the materials that I am working with; whether it be chain, filigree findings or the metal I choose. Then I find the proper beads or stones that will be complimented by these materials. Tell us about forming Majesta M? How did the company start and what is it's focus? Majesta M started as a design studio. I was designing and selling mostly to boutiques across the US. I was designing a collection around gunmetal chain and findings. After a few months of using ghastly chemicals to give us the gunmetal results, my husband, Jeff and I decided to have the chain and findings electroplated. Well, this forced us into having 100,000 pieces of each component done at a time. So we decided to have it done along with thousands of feet of chain. I was unable to locate gunmetal products so we launched the gunmetal chain and components end of the business. That line became an overnight success. We listened to our customers wants and did whatever it took to fulfill that need. Later, sterling silver, gold filled, copper, brass, tools, findings and such followed. Demonstrating how to use our products at trade shows lead to a demand for my teaching our customers. A. Give 100% customer service and treat our customers as a growing family. B. Know our products inside and out. D. Introduce the latest products and demonstrate them to all willing to listen. The talk of the trade is the huge rising price of silver. How do you think it will affect the industry? The rise of silver is a huge concern for us, as is the price of gold. We believe the price will come back down after the end of the year when confidence in a new president takes over. If that person makes improving our economy a priority, you will see a steady drop in gold and silver. What do you see as the trend in jewelry design? The trend throughout this year will be a major swing towards copper, gunmetal, silver and gold plate, as well as other alternative metals during this period of such high prices for silver and gold. You run your company, design jewelry and teach classes--what is most enjoyable for you? If I had to pick one, teaching would probably be the most fulfilling. My students come back again and again. This enables me to create a bond and friendship with them. I enjoy seeing them explore their creative side. A lot of my students have careers that don't allow them to explore their creative side. I enjoy meeting people from all walks of life. A family business is about building a relationship with your customer base. My advice for all up and coming jewelry designers is to find a supplier that you trust; someone that backs their products 100%. Don't sacrifice quality for rock bottom pricing. Go the highest end you can afford. You will never be able to compete with the Walmarts and Cookie Lee imported junk jewelry, so always use better materials than they do and make that your selling point. The folks at MajestaM seem to me to reflect, in many ways, the best traits of our business; honest, hard-working, sincere and friendly, with true concern and care toward both designers and hobbyists. I wish them well! I was thumbing through a past edition of Ornament magazine and found an ad that stopped me in my tracks. The ad showed a SIMPLY STUNNING gold cuff bracelet by designer Todd Reed, so I headed over to his website, http://www.toddreed.com/ and was confronted by some of the most beautiful pieces I have ever seen. He specializes in creating pieces that incorporate raw diamonds for a beauty that stands alone. What challenges and benefits do you think you gained by "going it alone"? Information was difficult to get, so I learned everything alone. A benefit is that I never learned what not to do in art or business. You are perhaps best known for your use of raw diamonds. Where did this idea come from and why do you use this form of the diamond? This idea came from a need to push society into looking at value in a new way; to challenge current social norms. What does the raw diamond reveal that is different from the faceted version? Nature’s version of perfection, beauty in a raw and innocent way. There are so many surfaces, colors, and textures that there are infinite examples of nature’s limitless versions of perfection. My natural environment and my market decide what will be made. I find your work beautifully subtle. What do you find most challenging about achieving this effect? The subtle nature of my work is the work; it must always be present. I have millions of ideas that will never be made. That is difficult. What is most challenging for you as an artist to also spend the time an energy necessary to make your work successful as a business? The most challenging thing is to mature and grow as a boss and business owner. Relationships alone need work and a growing company means adding and growing in relationship building. It is quite wonderful to have this challenge. You teach, create and show...what do you get from each of these aspects of your work? From teaching I get supporting community and giving to a healthy cause. Creating is what I call the “guts”, instilling to all happiness and joy and making the ideas. Showing is a culmination of efforts. The ultimate prize is the pride I get from taking our work to a show and selling it! What advise do you have for other jewelry designers and beginners? We have a short, upcoming show at I. Gorman in Washington, DC, from March 21-22. The Smithsonian Craft Show is always a pleasure, too; it runs from April 10-14 at the National Gallery in Washington, D.C. We are getting pumped up for the Couture show in Las Vegas. Look for us there from May 28-June 2 at booth #216. If you are on the East Coast, visit us at the JANY Couture show this summer from July 27-30 at booth #140. 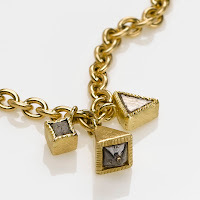 I'm heading to NYC for a business trip, but I plan to stop by DVVS Fine Jewelry in the Chelsea district to see some of Todd's pieces up close. 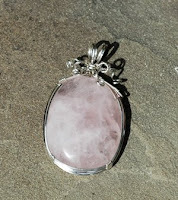 I noticed there are many other amazing jewelry artists at DVVS so look for some of of my favorites in future postings! You studied fine art and sculpture, but then chose to focus on jewelry design. Tell us what attracted you to this form of expression? Jewelry design has all the ingredients of making art, but it’s more fun and rewarding because I can focus solely on aesthetics, form, and function. When making fine art, at least with my background, the emphasis was always on content, then aesthetics. But then I got older and my focus changed. 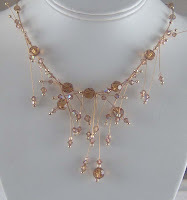 I love jewelry design because I can put my energies into combining form and function with aesthetics. Contemporary to begin with. I would like to be able to say Modern too, however I think I may not fall into that description strictly. Geometric perhaps, and also casual. I’ve always found it hard to stick to one “style” because a lot of things interest me. I do look to the Modernist jewelers from the Mid-Century. I also make note of how mechanisms work, on a simple scale, both man-made mechanisms and those in the natural world. And I can’t help but see jewelers working all around me who make the most inspiring work! I love to see it. Why thank you. I would say that ultimately the way it looks is a reflection of the way I solve problems and search for solutions through elements I find intriguing. I self edit A LOT. I think I must be searching for just that particular piece of jewelry that has an element of discovery to it; and you have to get up close to find it. The search is the challenge. What do you do when you struggle with inspiration? I have all these parts and bits on my workbench left from unfinished thoughts, or 3-dimensional note-taking if you will, which I use as building blocks for the next group of pieces. I also look at books, or go online to a website called Metalcyberspace. It is an amazing resource of people and information. It has a huge directory of jewelers’ websites. Sometimes, too, I just get out of the studio for a little while; take in new sights and sounds so-to-speak. What is most challenging for you as an artist to spend the time an energy necessary to make your work successful as a business? This is something I’m just learning about and I am finding it very challenging indeed to think of what I make as a business. Coming from the fine art background I have, I find it interesting that the things I’m creating cross the line into product. This is a counter intuitive intersection to me. The other challenge is one everyone knows about, organizing time. I have to remember not to let all the tasks involved with business creep in on the highest priority, making the jewelry itself. So I’ve needed to identify the times of day I’m best at being creative and use those to the best advantage. The rest of the hours, p.m. mostly, I use to take care of everything else. My biggest challenge is that I’m not a“p.m.” person. What do you think are the best ways to market one-of-a-kind jewelry? My first thought is to say through galleries that promote the Arts and Crafts. 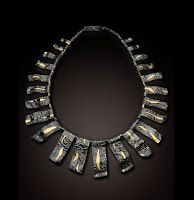 Right now, I think that is where people are best able to appreciate and understand the context of this unique jewelry. But it would be nice to come up with new venues for the Arts and Crafts; new ways for people to come across them. Again, I see it as that intersection of art and product/merchandise. It’s new to me and I’m giving it a lot of thought. You recently tried marketing your jewelry to wholesalers. What was that experience like? It was eye opening! Of course it was also my first event like it. Up until now I have sold my work only on consignment through galleries.The ACC Baltimore show presented me with a whole new set of variables. I enjoyed being a part of the community of Artists and Craftspeople for that week. Most fascinating is seeing/watching who buyers are, what they look for, what they ask about. Putting yourself in their shoes, you understand that they have looked at 750 booths (overloading!) in a day or two and are making decisions about where to put their money for the coming year–and not a good economic one either. What advise do you have for other jewelry designers? Set yourself apart. Advise I need to always keep in mind too. Holly also has plans to do retail shows this year such as the La QuintaArts Festival march 14-16 and the Tuscon 4th Street Spring Fair in April. Here's to 34 more years! 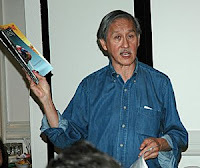 It was such a pleasure to attend a lecture by Ornament co-editor, Robert Liu at the Bead Society of Los Angeles meeting on 3/5/08. 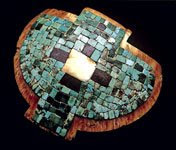 His topic focused on prehistoric mosaic jewelry from the Southwestern region of the U.S. In studying these very early forms of adornment, Robert was fortunate to gain access to specimens from the collection of the Pomona College Museum of Art and the Arizona State Museum. Most interesting was the notion that prehistoric Hohokan people of Arizona, traveled upwards of 300-400 miles, just to gather marine shells from the Pacific coast. Needless to say, these shells with turquoise from the area, were highly valued; formed into intricate mosaic pendant designs. Although some of the most beautiful pendants represented birds, the pendants were most often created into figures representing frogs. Some were realistic while others were more abstract. It's not clear why frog figures were so prominent, but their association with water, fertility and transformation in an arid climate may have been a factor (not to mention that one species, the Sonoran Desert toad, has gland secretions that have hallucinogenic properties). These prehistoric people had few tools, yet they were remarkable crafts people, able to create truly exquisite adornments--a testiment to what humans can accomplish when it seems important and adds meaning to their lives. I attended a great meeting of the Bead Society of Los Angeles last night. Our speaker was Robert K Liu, Ph.D, co-editor of Ornament magazine. It was a fantastic lecture...more on that to come! There was also an announcement that the Bead Society of Greater Washington is hosting the first annual international juried design contest to celebrate beads and beadwork titled, "Celebrating Beads the journey of". All proceeds will benefit the Bead Museum located in downtown Washington, DC. Prizes awarded in multiple categories and the deadline is July 25, 2008! Sounds exciting! I can't wait to see the great work submitted from around the world! And if you live in and around Los Angeles, don't forget to stop by the bi-annual Bead Bazaar featuring antique & contemporary beads plus designer jewelry, textiles, ethnic arts & books. It's on April 27th from 10AM-5PM. 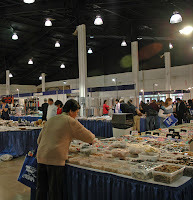 It's always interesting to see the wares at the big gem shows. I try to attend one at least every three months, so...this weekend I headed south from LA to Costa Mesa, CA. to take in the Gem Faire at the Orange County Fairgrounds. I got a free weekend pass, courtesy of You And Me Findings in San Gabriel who had one of the busier looking booths at the show. It might have been my imagination, but the show didn't seem as packed as I've seen in the past. The aisles were actually pretty clear and walkable versus the pandemonium I've seen at some of the other shows. Maybe it's the price of gas to get there (heading up to $4.00 a gallon although this is apparently news to "W") or the almost sickening rise in the price of silver....19.81 as of the close of the market on 2/29. 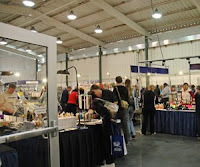 But, I took a great cabochon class from Majesta---one of the show vendors....more on Majesta M coming soon!